Good quality wine is truly the nectar of the Gods. Croatians know that best because almost every region has vineyards and is producing some really good wines that are just starting to be discovered around the world. Slavonija is the eastern region of Croatia and wine-making started here with the Romans in the 3rd century AD. 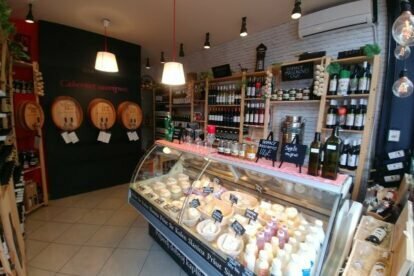 Winery Vino Ilok is one of three places in Zagreb where I buy my wines for different occasions — from family dinners to birthdays and other celebrations. Wines here are made in Winery Ilok in Ilok, Slavonija. They’re really affordable compared to their quality. I like them because they are easy to drink and go great with many dishes I like to cook at home, from fish to pasta and cake. With white meats my choice is Rajnski rizling, a white, dry wine with a fruity aroma. With red meat & cheese, I choose Merlot, a red wine with a strong taste of forest fruits & chocolate. And finally, Traminac, a sweet white wine that blends perfectly with the apple strudel my mom makes on Sundays. Besides wine, in Winery Ilok I buy my monthly supply of sweet, delicious homemade honey and rakija, a famous Croatian spirit usually made of grape or plum. Situated on a small, local market Jarun, this is my perfect spot after shopping some fresh, organic fruit, vegetable and meat, to find some wine to go with it or just do some wine and cheese tasting. It’s always wine o’clock somewhere, so cheers!